GEO Group and CCA are making a windfall from the rise of controversial family detention centers. A sick system, run by sick individuals, creating sick people. . . Shared over social media to spread awareness, Freya. Noted, thanks for sharing Freya. S&N. Thx, Freya. How is this not slavery? Greedy bastards! The entire system needs an overhaul!!! OLIGARCHY, friends.....that's what we've got now. Noted. Thanks for posting, Freya. Pam W. is right about the oligarchy. From article: ".....mass displacement from Central American countries where violence and poverty have been worsened by U.S,. policies." "....these facilities have been compared to Japanese internment camps." "...Geo Group and CCA have spent millions of dollars to lobby for harsher immigration policies, including a directive to fill 34,000 detention beds on a daily basis." So, the U.S. basically destroys an entire country by trying to gain control of it for "our" own financial reasons and purposes of control (to install a "puppet" government, acquiescent to our Corporate bidding). 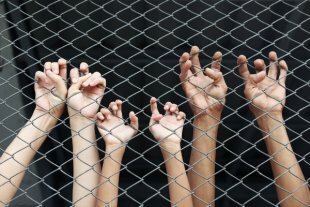 The people caught up in the violence have to leave their homes, and head to the U.S.---where they are then put in those horrible Corporate prisons and mistreated and abused. And, all of this is funded with our tax dollars. Due to the extreme LOWERING of taxes on the wealthiest & Corporations, and tax loopholes for said Corporations, these entities have many millions of dollars at their disposal.....to spend lobbying for tighter immigration laws and more money for their awful private prisons! Nothing like a win-win for those greedy creeps in charge of the corrupted system. I am so terribly disgusted. There has been a lot of criticism of Australian-run detention centres, (rightly so) but this doesn't sound much better. Profit isn't interested in human lives. Capitalists are people divorced from conscience, compassion, and humanity.